Tag-Connect cables provide a simple, reliable means of connecting Debuggers and Programmers or other test equipment to your PCB’s while lowering board costs and facilitating efficient production programming. Tag-Connect uses a specially designed (Patent Pending) connector which eliminates the need for putting a programming header or other mating connector on every PCB. Instead, Tag-Connect uses tried and tested spring-pins rated for 100,000 operations to make a secure connection to a special footprint pattern of pads and locating holes on your PCB. The footprint can take up as little board space as 0.02 square inches (about the space needed for a couple of 0805 SMT resistors) which means you can locate the footprint right next to the MCU if desired. 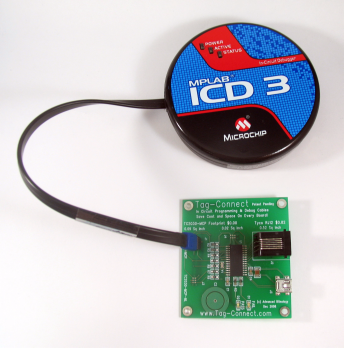 Tag-Connect uses a specially designed (Patent Pending) connector which eliminates the need for putting a programming header or other mating connector on every PCB. Instead, Tag-Connect uses tried and tested spring-pins rated for 100,000 operations to make a secure connection to a special footprint pattern of pads and locating holes on your PCB. The footprint can take up as little board space as 0.02 square inches (about the space needed for a couple of 0805 SMT resisitors) which means you can locate the footprint right next to the MCU if desired.